Preliminary results in Georgia's parliamentary election show the opposition group, the Georgian Dream coalition, is winning a majority of the popular vote. 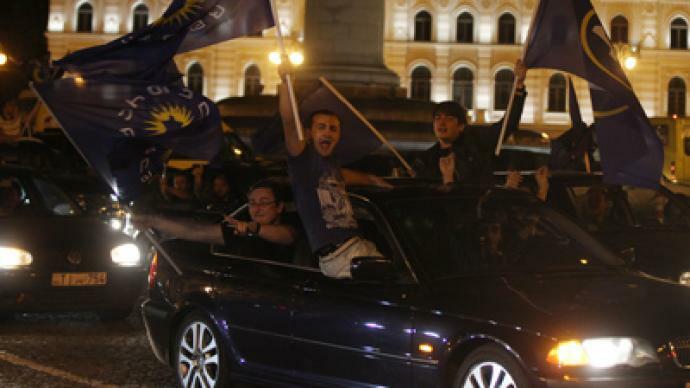 However, it remains unclear whether the party will win the majority of parliamentary seats. Central Elections Committee data indicates that 54.61 per cent of Georgians cast their votes for the Georgian Dream party. The ruling United National Movement (UNM) gained 40.44 per cent. Just over 20 per cent of the votes have been counted so far. The CEC said its website has suffered a denial-of-service attack, leading to a delay in the release of the results. “Our website was under DDoS attack, which has caused minor delays… but we were ready for such a scenario too,” said Elections Committee Chairman Zurab Kharatishvili, as quoted by Civil Georgia news website. Due to the country’s electoral system, Georgia’s ruling United National Movement (UNM) may still take home more seats in parliament. The exit poll results were met with clapping and cheers at Tbilisi's Freedom Square, where RT correspondent Alexey Yaroshevsky says a couple thousand opposition supporters have gathered. "The feeling in Tbilisi is that Georgia just won the football World Cup. There is loud celebrating, with cars honking and flags flying everywhere…Some great hip-hop beats are surrounding Freedom Square. The party’s on!," Yaroshevsky tweeted. Multiple exit polls display varying results, but all show the Georgian Dream party to be in the lead. A poll conducted by American company Edison Research, which was ordered by Georgian TV channel Rustavi-2, shows the opposition with 50 per cent of the votes and the ruling party with 40 per cent. The poll was based on a survey of 11,000 voters. Another poll, conducted by the NGO Voters’ League, shows Georgian Dream with 70 per cent of the votes and the United National Movement with 25 per cent. Georgian Dream's billionaire leader, Bidzina Ivanishvili, has already expressed his congratulations to the party. He also already urged UNM to cooperate with his party. “The people of Georgia need to react to our victory calmly and remember that those who voted for the UNM are our brothers,” Ivanishvili tweeted. However, the UNM has also claimed victory in the election. A spokeswoman for the UNM said the ruling party expects a majority in the 150-seat parliament, the Voice of Russia reported. "We still have to count up all the votes to see who will be represented in our parliament," Saakashvili said in a statement. 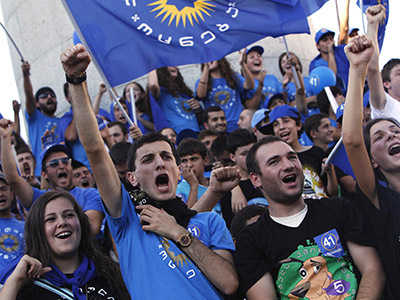 However, Ivanishvili says he expects Georgian Dream to win at least 100 seats – leaving the UNM with only 50 seats. The party which gains the parliamentary majority will be able to appoint a new prime minister next year. The prime minister will have more power than ever before because Georgia has changed its constitution, giving the position many of the powers currently held by the president. They said an attempt had been made to organize a “carousel” at one of the polling stations, as well as to put pressure on voters by issuing pro-Saakashvili reading material on site. 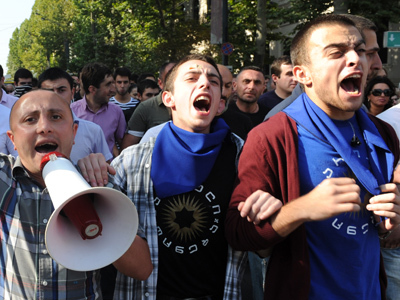 However, the country’s ruling UNM accused the Georgian Dream of pressuring voters and using the opposition coalition’s symbols – which is not allowed to take place on election day. The voter turnout in the country was higher than in previous years – by 5pm local time, 54 per cent of voters had turned up at the polls. The results come after Saturday’s protest against Saakashvili in the country’s capital of Tbilisi. Over 200,000 people took to the streets to express support for the opposition while chanting anti-Saakashvili slogans. ­Meanwhile, Georgian media report that security forces clashed with local residents at a polling station in the town of Khashuri, not far from the capital, Tbilisi. Three people were injured after security forces fired rubber bullets and tear gas at people who gathered near the polling station, opposition news station TV-9 reported. No cause for the incident has been cited. The Georgian Interior Ministry has denied that its forces opened fire on the crowd. An observer group, Transparency International Georgia, claims falsifications took place in Khashuri. “Our observer present at precinct No. 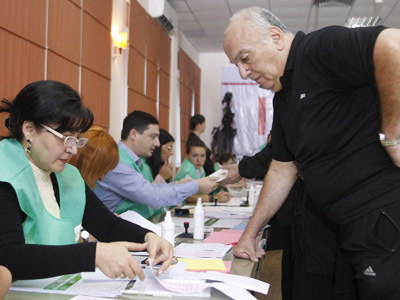 46 reported that Georgian Dream had most of the ballots in a vote summary protocol, but shortly afterwards, armed persons arrived at the precinct, and kicked all the observers out of the building. A new summary protocol was made in which the United National Movement was the winner; the District Election Commission accepted this very protocol,” TI Georgia said as quoted by Civil Georgia news website.